On October 18th, The Adetem B2B CLUB took its districts on the prestigious Passeig de Gracia in Barcelona, for a french-speaking session. With the participation of InConcert. Managing marketing performance to improve customer experience. The bias was to get 3 companies of different sizes & sectors to testify, in order to understand where marketing teams stand with “their” customer experience. There was no Customer experience expert to judge  or guide us. (For expertise, see links at the end of the article.) There were only marketers who came to exchange and discuss new practices and challenges ahead of us. Jacques Reynaud – Global Head of Market Development @ Polyglot Group, Australian company, 90 employees. But before going any futher, what are marketing performance & user experience? Marketing performance is searching to improve marketing results through it efficacy and efficency. Customer experience refers to all  emotions and feelings felt by customers during their customer journey. Customer experience can not exist if customerculture is not first developped, at every level of the company, coming top down. No happy customers without happy employees. Jacques’ opinion is People first” comes before “Customers first”.Polyglot Group measures their employees satisfaction, as employees are the main actors of customer experience. Marketing now initiates the relationship, nurtures it and Sales enhance it. That requires the emergence of new marketing skills, including the ability to embrace digital channels used by customers themselves and new technologies (CRM, marketing automation,…). And the ability to measure and drive marketing performance. – Update our database is a must, whether in Excel or in CRM depending on the size of your company and your appetite for technology. Personnaly, I use HubSpot which offers a free version from small companies. – Engage with their customers, Polyglot Group sends them a birthday card celebrating their first year working together. – Personally, I have my moments of truth : I send a customer satisfaction survey after each mission. – Monitor indicators that confirm what customers like. What content do they like on your web site or social medias ?By the way, do you have a Content strategy ? – Do not hesitate to create dedicated roles to manage customer relations: Jacques explains the role of Relationship Keepers, who, as their name suggests, are in charge of customer relations. Marketing delivers content to them, and then they are the one who engage with customers. Stéphane would like marketing to be able to renew and question itself: why do we do what we do? what does it bring to our customers? how do we solve to their problem? This renewal, and the positioning of the customer at the centre of the strategy, must be clearly reflected in the operational marketing plan! We then shared the indicators we were tracking with the audience. Quoting them quickly, out of context, would not serve this post: it all depends on the steps of the journey and the objectives set. The analysis of the customer journey and its key moments are revealing so much! In conclusion, many questions, many exchanges, and the desire to go further in the management of the customer experience! Before concluding, let’s doa short test to understand where you stand with YOUR customer experience. Before kicking off your customer experience strategy, Josélito, an enchanter at Merlin/Leonard suggests we answer 3 simple questions (no cheating and looking into our CRM): Who were my 10 largest and 10 smallest customers, over the 12 months? What total turnover do they represent? Who are the clients I don’t want to work with anymore?…come on, we all have 1. Did you know the answers? Congratulations! Believe it (or not), not many of us know our customers and yet this is where it all starts! Finally, I will let Jacques conclude: Performance in English also means “entertainment”, which objective is to make customers happy ! If you would like to know more about marketing performance, please contact me ! 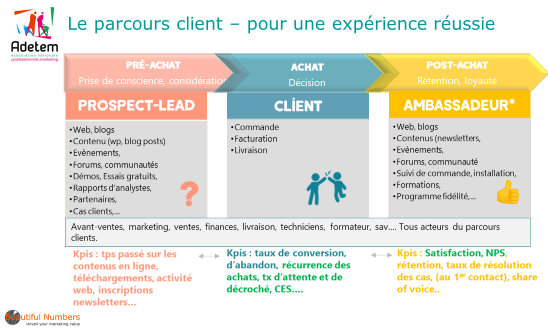 Read more about the event : What the audience said, and more content: Marketing performance : measures and accountability, L’expérience client est l’élément central de la transformation digitale , Where does your marketing organization stands with marketing performance management ?